1. 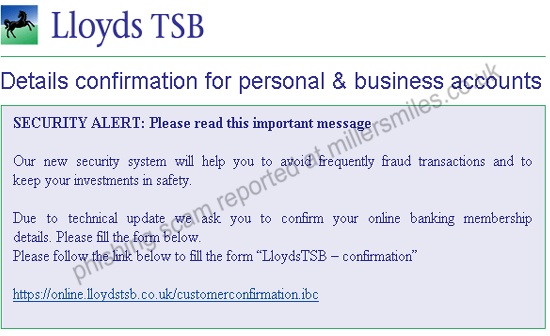 Email claims to be from Lloyds TSB asking you to confirm your account data by clicking on the link. You will be taken to a spoof login page where your details will be captured by the phishers. 2. Lloyds TSB never send users emails requesting details in this way. 3. URL of spoof website disguised by an image in the body of the email - a technique used to bypass spam filters. 4. Real URL looks nothing like Lloyds TSB. 5. Spoof website apparently not online time of report - may have been disabled, but may be reactivated, so be wary! 6. Scam email is one of several variants reported today and recently.
" Our new security system will help you avoid frequently fraud transactions and to keep your investments in safety."